Personal Support Workers attend to the diverse needs of individuals who rely heavily on the help of others. They have a variety of roles including caring for a person's hygiene, making sure they are nourished, dressed, toileted, validated, comfortable and happy. Most importantly, PSWs may be the only human connection some individuals receive in a single day. Yet, while they are offering their valuable support, it can feel thankless when trying to bathe and clean an uncooperative incontinent person, soothe the irritable and feed the ungrateful who are not longer able to do things themselves. Gail Elliot An international dementia expert providing insights on how to best care for people with dementia. Which jobs tend to receive the most attention and the highest and greatest accolades? Is it doctors, lawyers, statesmen and women, fashion designers, inventors, researchers, athletes, singers, actors or is it CEOs of large corporations? Are these the people that are most often noticed for their exemplary contributions to our world? Many people in these, and other similar positions, attract the attention of the media, command generous incomes, and receive rewards and/or other forms of recognition for their great work and major contributions to their discipline. We thank our doctors, chiropractors and therapists for that prescription or treatment that made us 'infinitely better'. While these individuals undoubtedly deserve recognition, there is a group of people who work on the front-line of healthcare doing amazing work each and every day, but they are not at the forefront of public or corporate attention. The Personal Support Worker (PSW) is rarely, if ever, found on a "Top 10" list of "who to watch" and "who to thank". These people are seldom in the limelight. We need to change our line-up of "The Best Of . . ." and learn to develop an attitude of gratitude by offering worthy recognition and sincere appreciation for a job well done. This group deserves sincere thanks for the care they deliver to those who can no longer take care of themselves. Personal Support Workers deserve worthy recognition for adding quality of life to the most frail and vulnerable people in our society. 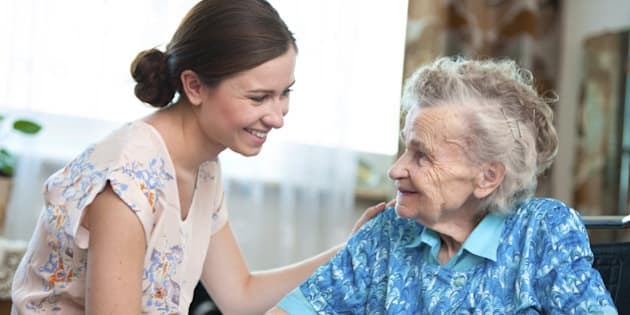 When we consider the current model of healthcare, PSWs are major players within our organizational infrastructure as they are the champions in both the health component and the care component of personal and practical aspects of support and care. They give the gift of time and patience as they work capably and compassionately with persons who are often in poor mental and/or physical health. Good dementia care, in particular, relies on their care, compassion and commitment to the responsibilities they embrace each day. As a family member, colleague or friend of a person who is in the caring hands of a PSW, we must be reminded to extend our most sincere thanks. With this short poem the DementiAbility staff, families and colleagues from around the globe would like to voice our appreciation and say thanks for all you do. Dr. Christopher Patterson, in his role as a Geriatrician, also lends his support, thanks and praise. Thank you for being the eyes, the ears, the hands and the voice of one of the most frail and vulnerable sectors of our society. While those in your care may not be able to express their thanks, please know they are grateful. Thank you for opening your hearts up to the concerns they share. When the days are long and the rewards are hard to see, please know you are deeply and sincerely appreciated. While there may be times you believe your job is thankless, remember that the world is a better place because of the work you do. Thank you for treating those in your care as a mother, a father, a best friend - not just as a case file. Thank you for seeing those in your care as a whole person - not just a "feed", a "toilet" or a "bath". Thank you for making sure each person is nourished and hydrated, clean and dignified. Thank you for tending to those small details that make the biggest difference. Thanks for helping those in your care to feel loved and cared for. Thank you for putting a smile on the faces of those you help each day. Thank you for governing the homes and spaces they keep. Thank you for making sure they are safe and stable as they move about. Thank you for keeping their space "familiar", in a way that feels comforting and looks and feels like "home". Thank you for offering a nurturing touch and the best of care. Thank you for caring for their needs on days when you've been too busy to meet your own. Thank you for your kindness and patience. Thank you for working with us as families and fellow staff. From the bottom of our hearts -- THANK YOU! A deep and heartfelt thank you from the DementiAbility Team! We sincerely appreciate all you do. We say.... THEY MAKE A DIFFERENCE! *Note: The term Personal Support Worker varies according to location. Each province/state/country has its own term. Gail Elliot, Founder, DementiAbility Enterprises Inc.